These glamorous accessories that bring together fashion and functionality will make the recipients feel truly special. Offered in a range of brilliant colors and designs, metal water bottles that are resistant to breakage are well suited for all types of promotions and events. Choose from various models including bike bottles, carabiner bottles, sports bottles and more. These bottles will serve water fresh without any change of taste or odor, which is another plus point of these water bottles. 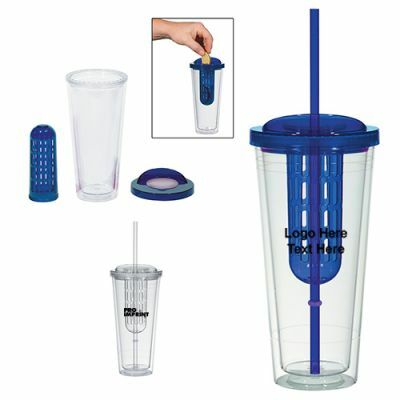 Imprint your brand and message on these to grab easy attention. Offered in a range of colors, Plastic water bottles exude a casual charm and brilliance that will light up even a dull day. These BPA free plastic bottles are offered in various popular models like bike bottles or carabiner bottles that will put your message portable. 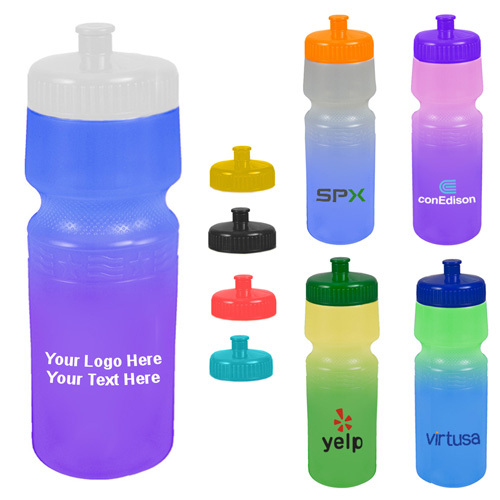 24 Oz Cool Color Change Bottles is a great choice to engage your audience with a friendly dialogue with your brand. These water bottles change colors when cold drinks are added. The pliable material allows for a quick squeeze while the brilliant translucent colors will inspire the audience to ensure plenty of water intake. These make great back to school gifts or field trip handouts. Your audience will spend hours on end watching this unique spectacle of changing colors every time they pour cold drinks into it. Water bottles with infusers will make a smart choice to stay healthy and enjoy the natural flavors and goodness of fruits. Be it fresh lemons, strawberries or mint leaves- no matter what your favorite flavor is, these fruit infuser water bottles are a perfect way to stay hydrated. A fresh flavor and nutrients will get your audience excited about your brand and a fit lifestyle. Put your brand and message to strengthen your business-client relationship. The outdoorsy clients and people on the move will like these collapsible water bottles for its ease of use and lively color choices. These custom water bags are great for walkathons and sports events as these are light weight, portable and above all reusable. Put your brand, message or logo on these to make a perfect reminder of your milestones or achievements. Are you planning to use water bottles as your custom gifts to add a fresh bout of vitality to your branding campaign? Do share your ideas with us at our facebook page to join the discussion.